As a customer focused company, we realise that the customer comes first. 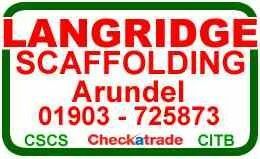 We offer good honest advice, a firm quotation and our experienced scaffolding team (all CISRS and CSCS registered) complete the work in a timely and professional manner. Public & Employers liability insurance to the value of £10 million. Over time this has lead to good customer relations ensuring all customers receive the best possible service so they come back to us in the future and recommend us to others.